Faced with a possible shock rejection of TTIP by MEPs, Brussels simply cancelled the vote this week – and now Washington moves swiftly to speed up the publicly unpopular trade deal. For a while there, it looked like the EU/US TTIP deal – the monumental power grab by corporations over democracy – was, far from “fast-tracking” in the US, crawling along the slow lane, or maybe even stalled in the hard shoulder. Democrat senators dug their heels in last month on TTIP (and the equally contentious Trans-Pacific Partnership (TTP) deal), claiming these trade deals would drag down US wages and cost American jobs. But these Democrats eventually decided to switch sides. And now it looks like Obama is going for a high-stakes vote to renew the ‘fast-track’ TTIP negotiation process (minimising democratic oversight) as early as tomorrow (Friday). It’s in this light that we have to view the scandalous decision by the EU presidency to deny myself and other MEPs a vote on TTIP this week. A vote on the deeply unpopular deal was due on Wednesday - the first big test of all MEPs on TTIP. In recent days, a shock upset looked possible. Both socialist and conservative groups alike were coming under massive public pressure. A network of 170 European civil society organisations have denounced the deal as a threat to democracy and an attempt to put the interests of big business before the protection of citizens, workers, and the environment. Almost two million people have signed a European Citizens’ Initiative petition against TTIP, and there have been large demonstrations across Europe. During the last week or so, MEPs including myself have received thousands of emails every day – an unprecedented level of interest from the public who normally find EU issues somewhat remote. 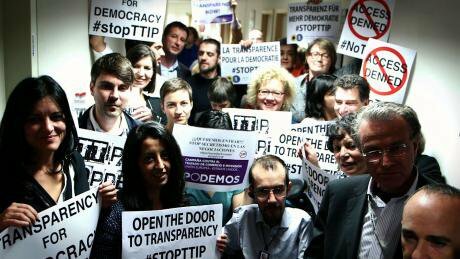 The public were in particular urging MEPs to rally behind a cross-party amendment (supported by Greens and other Left MEPs including some Socialists) to put on record parliament’s unequivocal opposition to one of the most contentious aspects of TTIP - the Investor State Dispute Settlement (ISDS) mechanism. This would involve the setting up of special courts to allow corporations to sue governments if they pass laws which limited a corporation’s profits or activity – even their future profits. Political parties were running scared. It looked increasingly possible that the EU parliament would, in defiance of its leadership, put on record either its opposition to these ‘investor courts’ - or even to TTIP as a whole. Such a defeat in Brussels, whilst not ultimately decisive, would have made matters extremely awkward in Washington as they approached a highly sensitive stage – and maybe even derailed the whole process. But then, in a highly unusual move, the EU vote was pulled at the last minute. The official line from the parliament is that because more than 200 amendments were tabled the vote should be postponed to enable the trade committee to consider the amendments before tabling them for a future plenary session. Actually, this was a scandalous attempt to remove the right of all MEPs to vote, or even speak out in parliament, on this very important report on TTIP, at a critical juncture on both sides of the Atlantic. The vote now returns to the trade committee for redrafting, and it’s currently unclear if MEPs will get a vote on it this side of the summer. Meanwhile in the US, in an attempt to win over wavering Republicans on the trade deal, the US government has promised that it will be prevented from containing any requirements for the US to take any action on climate change. The EU leadership is cheating MEPs of our rights to represent the will of our constituents. Our rights to defend hard-fought-for regulations on workers rights, environmental protection, public services and animal rights, which are all threatened by the ‘harmonisation’ of standards and a potential race to the bottom on standards. And our right to oppose investor courts (ISDS). TTIP is a good example of the democratic deficit in the EU and how this can be exploited by corporations to further their interests, often at the expense of Europe’s citizens. Because the EU is not a nation state, democratic representatives in the member countries have little oversight of the negotiation of treaties. In the case of TTIP this negotiation is delegated to officials working for the Commission. None of the people involved have a democratic mandate. True, the Treaty that is eventually negotiated will have to receive a vote of approval in the European Parliament and can be vetoed by any member state in the Council of Ministers. But – whilst Obama has to fight for his “fast track”, in the EU, the Commission has a permanent fast track. The disgust that many in Europe are now feeling about the threats from TTIP cannot be used to put pressure on their elected representatives, who have very little power in this process. Corporate lobbyists, by contrast, are free to lobby trade negotiators and employees of the Commission, who never have to account to citizens for their actions. Private interest groups overwhelmingly dominated the European Commission's TTIP consultations. With nine out of ten lobby contacts during the preparatory phase of the negotiations being with companies and corporate lobby groups, they have effectively co-written the TTIP agenda. And it is clear that citizen’s voices are being ignored. Since the results of the Commission’s own consultation on the insidious Investor State Dispute Settlement (ISDS) clause were released, showing a 97% rejection rate by respondents, a panicked Commission has desperately sought to come up with magic language to save it. But they only talk about what sort of ISDS we want, and never about whether we want to keep it at all. Those of us who are supportive of the EU project on the whole, but critical of TTIP, must challenge the positive assumptions shared by many EU governments, including our own, that TTIP is a "win-win" for citizens here and in the US. The debate taking place in the US shows this to be a false premise. We need to defend our European democracy and our values, by joining those standing up to big business interests. The European Union delivers many positive impacts for its citizens and for the wider world; but the secret negotiations surrounding TTIP are undermining trust. To restore citizens' faith we need our representatives in the European Parliament - the Union's only elected body - to be given a real voice in such negotiations, and full disclosure of all negotiation texts. This will allow citizens and their representatives to judge whether TTIP will see everyone win, as promised by its proponents, or whether the deal will indeed be a serious threat to health, welfare and environmental standards as feared by its many opponents.